GREAT for Valentines! I can make into a gift basket of lips, hearts and mustaches for your loved one at a small extra fee. I can even print the two of you on edible icing paper and apply to pops. 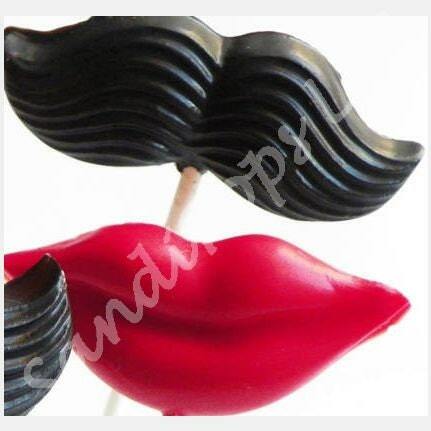 This listing is for 24 lollipops- 12 of each red lips and brown mustaches, unless you specify colors and quantities (pink, white, dark chocolate). Each lollipop is individually wrapped in a bag and tied with a curled ribbon in a corresponding color. I can certainly make any number of pops you need, convo me for pricing. I can also make any number of any colors you wish to match your wedding colors. I can also add Thank you tags at an additional cost.